A step closer to serving millions of people worldwide. 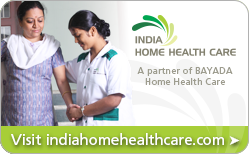 India Home Health Care (IHHC) is pleased to introduce new home care services, designed in collaboration with our partner for quality care, BAYADA Home Health Care, to support Non-Resident Indians, in the United States, with elderly parents living in India. With services provided in the comfort of home, mom and dad can get the care they need with compassion, excellence, and reliability. For many adults caring for their aging parents, one of the most difficult decisions you can face is when to get involved in your loved one’s care. India Home Health Care can lend a helping hand to hard working sons and daughters; Non-Resident Indians, who cannot care for their loved ones themselves. Home health care services include help with personal care and services for those who require skilled nursing assistance. India Home Health Care ensures your parents remain in good health by constantly monitoring their physical condition. Before we visit your parent’s home an initial assessment is performed. IHHC’s clinically trained team, in conjunction with immediate family members, and the treating physician will use this assessment to determine the best plan of care for your parent. This plan of care will outline specific services that will be provided to your parents. The staff will then determine which care provider is best suited to your parent’s needs, assign care providers, and schedule an appointment for senior staff to make an initial visit. If your parents have special requirements, the India Home Health Care Client Coordinator will include this in documentation for future visits. During the visit our senior registered nurse will conduct a detailed assessment to identify any significant changes in health from the last visit. The senior registered nurse can then advise the India Home Health Care team on the next steps, if any are required. Senior staff with India Home Health Care will also call your parents to ensure they are receiving excellent, reliable, and compassionate care. These telephone check-ups will give our clients the opportunity to ask any questions or raise concerns. The IHHC team will communicate with you regularly via telephone and email. IHHC will also provide you with well-documented assessments that are available via email for your review. For more information about how to get care for your parents in the comfort of home contact us today. Written doctor’s orders for home health services and treatments based on the patient’s condition. The plan of care is developed by the doctor, the home health team, and the patient. The home health team keeps the doctor up-to-date on the patient’s condition and updates the plan of care as needed. It is the doctor, and not the home health team, that authorizes what services are needed and for how long.